What is our current state of Indonesian architecture exhibition. Do we need architecture exhibition? What is the current state of architecture appreciation? In what sense architecture exhibition will provide value to culture, society, and further agenda? Do we have a good reflection of our current paradigm? Is there any good critic attitude? To see the quality of the exhibition, first, it really depends on the agenda of the curator, what the meaning of the exhibition is, Why the exhibition, and How it is executed. Off course some of the curator might think that why do we need an agenda? Why don’t we just exhibit whatever we have, and let public decide? Inside the mastermind of the curator there are various agenda, I don’t believe in there is no agenda in the exhibition, there are only 2 agendas, private of social agenda and There are 2 streams of paradigm, the first one is agenda which is more introvert, to show a set of skill, mastery in architecture. The other is a more extrovert, more social; it’s about showing social agenda to the public. We can refer to David Hutama’s lecture in Omah Library, I summed that architect needs these 3 skills in architect profession: It could be skill as artisan, technician or even social businessperson. The two streams sometimes can be combined depends of the agendas, more introvert or more extrovert, mixed depends more to the curator who is the driver of the exhibition. The exhibition quality depends on the depth of the agenda, and communicating the idea to the public. Universitas Pelita Harapan once has brought complete set of information of showing mastery and social agenda, in their academic agenda, by exhibition waktu adalah ruang curated by Fernissia Richtia, Robin Hartanto, and Andreas Annex. The exhibition shows a complex stage from basic stage to learn architecture, which was experienced by students by understanding the small: hinge and joint to the big or macro, which is the urban level. There are many details, big scale model, well written explanatory and finally there was book launching to sum up the whole information. 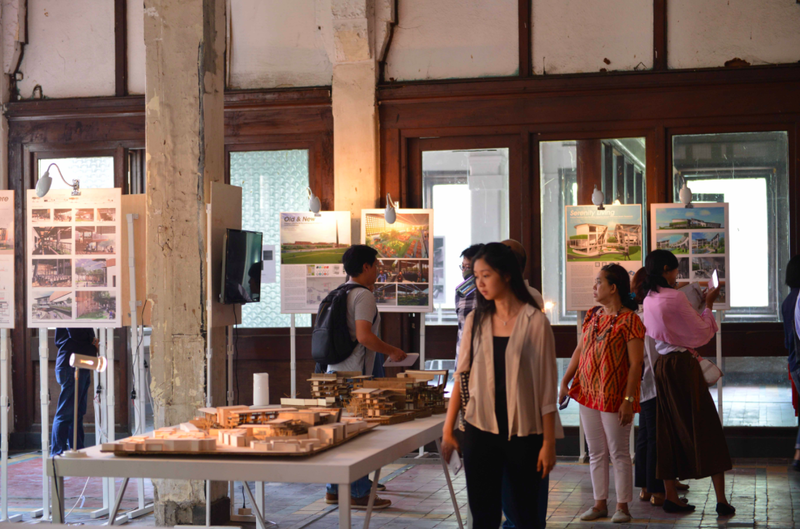 The models in Waktu adalah Ruang Exhibition exhibited with storyboard from intimate to more public project, showing the understanding from micro to macro. Meanwhile the exhibition in like indobuildtech showing more commercial Agenda and Exhibition Segar showing more political agenda in relation to moment of Indonesian Institute of Architect. Reflecting in this selection process and the empathy to the public. I did critic for some of the exhibition titled Segar few months ago. The curator selected the participant. I was thinking if this exhibition was intended for celebrating the moment of selection of chief of Indonesian Institute of Architects. Deep in my mind I have so many questions, but fundamentally why should we, that we are in Jakarta, which already has reputations, 50 architects or more trying to show existence by having less agenda. It would be great if some of the architects, from outside java, unheard, but has ingenious work and several limitations of information, could be invited to collaborate in exhibition as a part of political agenda to unite architects in Indonesia. In the architecture, architects have their own label, and branding, off course it could be an attraction as the name is announced in the exhibition, but does the content is more important, because the architects who have great branding, started from zero by their amazing work, it’s not instant, it’s long journey, to start the career, some of the architects like Gehry, Mayne, the need 10 years to train and produce body of work. Paragraf terakhir harusnya textnya di-BOLD semua, message dari tulisan ini saya rasa ada di situ. Semua exposure tentang ranah kreatif arsitektur terlalu di Jakata….IMHO, Indonesia menurut saya bukan jakarta. Kenapa tidak exposure dibuat lebih berimbang…lebih membuka pandangan publikasi arsitektur ke-jakarta-an untuk lebih memberikan kesempatan para penggiat arsitektur yang berada di daerah (yang sangat lebih beragam atas konteks yang jauh lebih berbeda ketimbang jakata) agar mereka bisa memperkaya lagi apa-apa yang sudah dicapai saat ini….